Chandigarh, April 15 (IANS) Punjab Chief Minister Amarinder Singh on Monday questioned the absence of Prime Minister Narendra Modi and the Badal family from the events to mark the centenary of the Jallianwala Bagh massacre by British forces. 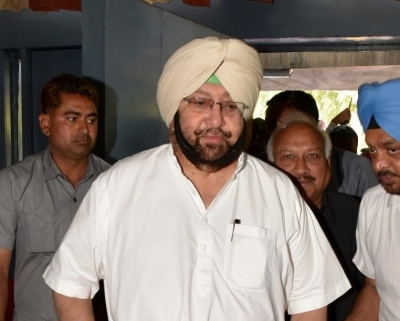 Accusing the Prime Minister of "serious discrimination against the Congress government in Punjab in matters of religious importance as part of his and his party's divisive agenda", Amarinder Singh upped the ante against Modi, who on Sunday chose to target him (Amarinder) in a speech at Kathua. Amarinder Singh asked why the Prime Minister had not attended the event or pointed fingers at the Shiromani Akali Dal (SAD) leaders, including former Chief Minister Parkash Singh Badal, SAD President Sukhbir Singh Badal and union Minister Harsimrat Kaur Badal for failing to attend the central government function to commemorate the centenary of the Jallianwala Bagh massacre. "Neither Prakash or Sukhbir Badal nor Harsimrat Badal, who happens to be a Minister in Modi's own cabinet, deemed it fit to pay their homage to the martyrs at the historic Jallianwala Bagh. Yet Modi, who himself chose to keep away from this occasion of national importance, had criticized me even though I had been part of a series of events at the Jallianwala Bagh national memorial over two days," Amarinder Singh said in a statement here. "Why was Modi not present at this major event? Why did the Badals fail to turn up, and why did the Prime Minister chose to conveniently ignore their absence?" asked the Chief Minister. Interpreting Modi's actions and words as part of his government's persistent discrimination against the Congress government in Punjab, Amarinder Singh said that the central government chose to hold a parallel event to mark the Jallianwala Bagh centenary instead of supporting the state government's commemorative programmes.